This week’s Monday Escape is really an escape in many senses of the word. Vang Vieng is a tiny city in Laos with a big reputation among backpackers, where many adore the place and many others loathe it. 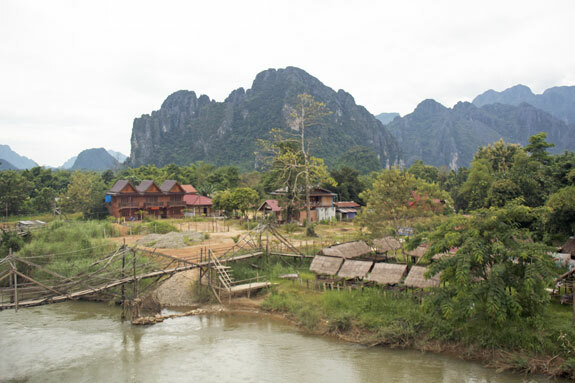 It’s actually quite easy to avoid the part you might loathe, so nearly anyone looking for a cheap and beautiful place to drop out of society for a while, Vang Vieng might be a good candidate. The tourism industry in this town exists only because the bus ride between the capital city of Vientiane and the most popular tourist city – Luang Prabang – takes so long that most sane people prefer to split it into two separate days. Vang Vieng is a bit closer to Luang Prabang, but the roads in the direction are slower due to many more winding switchbacks, so it’s close to the middle point time-wise. Set alongside a winding river, there are karst formations looming over Vang Vieng, helping to make it breathtakingly beautiful. The town itself isn’t terribly special to look at, but the surrounding scenery easily makes up for it. Younger backpackers flock to the town for two main reasons and both contribute to the fact that some people don’t like the place at all. The first is the daytime activity of tubing, which means you rent a huge inner tube and pay a truck to take you and your friends up the river. Then you jump in and float back towards town, stopping at touristy bars pumping loud music along the way. It’s refreshing, but if you don’t like loud music and drunken backpackers then it might be worth skipping. The other activity is the nightlife, which consists of a number of outdoor bars that blast club music at surprising volumes well into the night. They are mostly based on the “island” (remote area in the center of two forks in the river), so if you want to avoid the loud music it’s easy to do by just choosing a hotel in another part of town. But really this is a perfect place to just chill out and enjoy the beauty and serenity. You can walk the entire town in about 15 minutes, but most restaurants are pretty much identical so it’s best to just find one with a vibe you like and park yourself there. Guidebooks and websites will warn you that most restaurants and bars in Vang Vieng are playing endless loops of “Friends,” “Simpson’s,” and “Family Guy” DVDs, and that is mostly true. However, there are plenty of other options that play music or nothing at all, so just keep walking until you find the vibe that suits you. Nearly all restaurants in Vang Vieng have at least half of their tables in an “Eastern” style, with a very low table that is surrounded by comfortable pillows. In other words, it’s made for comfort and long visits, so the day can easily get away from you if you aren’t careful. People wanting to drink and ride inner tubes and then party at night will be in paradise, but those seeking just a mellow escape from the rat race can easily pull that off if they choose their hotel and hang-outs carefully. 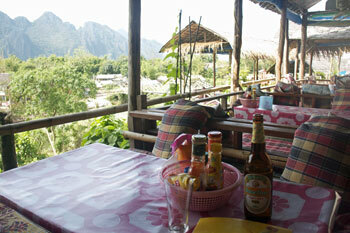 Perhaps the best feature of Vang Vieng, aside from its beauty, is that it’s incredibly cheap. Hotels for around US$10 per night are easy to find, with a few starting even below that. Many are nicer and more modern and charge a bit more, so there’s something for every budget and standard. Food and drinks are also fantastic bargains, with full meals starting around US$2 each at pretty much every restaurant in town. You’ll find things like steak or some fancy Italian dishes starting around US$5 each, but there are also excellent sandwiches available from little stands on the street for around US$1 each. Those who appreciate the fine Beerlao lager that is so common in Laos will be happy to know that the standard price of just over US$1 for a .7-liter bottle is at pretty much every restaurant and bar in town. The nightclubs with loud music do charge a bit more, and cocktails will cost more as well, unless you get one based on the Laolao rice wine, which is even cheaper than beer.